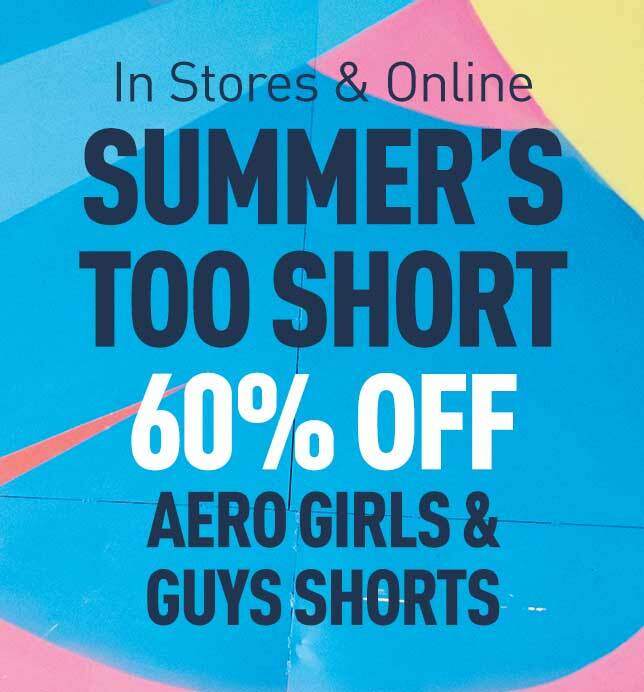 Aeropostale.com is operated by Aero OpCo LLC (“Aero”) on behalf of itself and its affiliates (the "Web Site"). PLEASE READ THESE TERMS AND CONDITIONS CAREFULLY BEFORE USING THIS WEB SITE. YOUR USE OF THIS WEB SITE CONFIRMS YOUR UNCONDITIONAL ACCEPTANCE OF THE FOLLOWING TERMS AND CONDITIONS. IF YOU DO NOT ACCEPT THESE TERMS AND CONDITIONS, DO NOT USE THE WEB SITE. Users of all ages are welcome to browse the Web Site under the terms set forth herein, however, you may only establish an account if you are of the age of majority in your state of residence - which is usually 18- or older. In order to purchase products or services from the Web Site and in order to access or use some features on the Web Site, you may be required to establish and use an account. In addition to your name and contact information, you may be required to submit a valid credit card number, billing address, and related billing information in connection with your account. When you register for an account you must (i) provide accurate and truthful information and (ii) update such information from time to time as necessary to keep your registration information current and accurate. By establishing an account, you represent and warrant that you have the right and are authorized to provide the information you provide when you register for the account and further that you have agreed to these Terms and Conditions. You are responsible for maintaining the confidentiality of your account information and password and for restricting access to such information and to your computer or device. All activities that occur under your account or password shall be your responsibility. In the event you become aware that your account or password have been lost, compromised or are being used in an authorized fashion it is your responsibility to contact our customer service immediately. We attempt to ensure that information on the Web Site is complete, accurate and current. Despite our efforts, information on the Web Site may occasionally be inaccurate, incomplete or out of date. We make no representation as to the completeness, accuracy or currentness of any information on the Web Site. For example, products included on the Web Site may be unavailable, may have different attributes than those listed, or may actually carry a different price than that stated on the Web Site. In addition, we may make changes in information about price and availability without notice. While it is our practice to confirm orders by email, the receipt of an email order confirmation does not constitute our acceptance of an order or our confirmation of an offer to sell a product or service. We reserve the right, without prior notice, to limit the order quantity on any product or service and/or to refuse service to any customer. We also may require verification of information prior to the acceptance and/or shipment of any order. All features, content, specifications, products and prices of products and services described or depicted on the Web Site are subject to change at any time without notice. Certain weights, measures and similar descriptions are approximate and are provided for convenience purposes only. We make all reasonable efforts to accurately display the attributes of our products, including the applicable colors; however, the actual color you see will depend on your computer system, and we cannot guarantee that your computer will accurately display such colors. The inclusion of any product or service on the Web Site at a particular time does not imply or warrant that the product or service will be available at any time. It is your responsibility to ascertain and obey all applicable local, state, federal and international laws (including minimum age requirements) in regard to the possession, use and sale of any item purchased from the Web Site. By placing an order, you represent that the products ordered will be used only in a lawful manner. From time to time, the Web Site may contain links to web sites that are not owned, operated or controlled by Aero or its affiliates. All such links are provided solely as a convenience to you. If you use these links, you will leave the Web Site. Neither we nor any of our affiliates are responsible for any content, materials or other information located on or accessible from any other web site. Neither we nor any of our affiliates endorse, guarantee, or make any representations or warranties regarding any other web sites, or any content, materials or other information located or accessible from any other web sites, or the results that you may obtain from using any other web sites. If you decide to access any other web sites linked to or from the Web Site, you do so entirely at your own risk. You are prohibited from posting or transmitting any unlawful, harassing, insensitive, threatening, defamatory, libelous, obscene, pornographic or profane material or any material that is derogatory towards, among others, any individual, race, religion, gender, sexual orientation or could constitute or encourage violence or conduct that would be considered a criminal offense or give rise to civil liability, or otherwise violate any law on or through the Web Site. In addition to any remedies that we may have at law or in equity, if we determine, in our sole discretion, that you have violated or are likely to violate the foregoing prohibitions, we may take any action we deem necessary to cure or prevent the violation, including without limitation, the immediate removal of the related materials from the Web Site. We will fully cooperate with any law enforcement authorities or court order or subpoena requesting or directing us to disclose the identity of anyone posting such materials. YOUR USE OF THE WEB SITE IS AT YOUR RISK. THE INFORMATION, MATERIALS AND SERVICES PROVIDED ON OR THROUGH THE WEB SITE ARE PROVIDED "AS IS" WITHOUT ANY WARRANTIES OF ANY KIND INCLUDING WARRANTIES OF MERCHANTABILITY, FITNESS FOR A PARTICULAR PURPOSE, OR NON-INFRINGEMENT OF INTELLECTUAL PROPERTY. NEITHER AERO NOR ANY OF ITS AFFILIATES WARRANT THE ACCURACY OR COMPLETENESS OF THE INFORMATION, MATERIALS OR SERVICES PROVIDED ON OR THROUGH THE WEB SITE. THE INFORMATION, MATERIALS AND SERVICES PROVIDED ON OR THROUGH THIS WEB SITE MAY BE OUT OF DATE, AND NEITHER, AERO, NOR ANY OF ITS AFFILIATES MAKES ANY COMMITMENT OR ASSUMES ANY DUTY TO UPDATE SUCH INFORMATION, MATERIALS OR SERVICES. THE FOREGOING EXCLUSIONS OF IMPLIED WARRANTIES DO NOT APPLY TO THE EXTENT PROHIBITED BY LAW. PLEASE REFER TO YOUR LOCAL LAWS FOR ANY SUCH PROHIBITIONS. ALL PRODUCTS AND SERVICES PURCHASED ON OR THROUGH THE WEB SITE ARE SUBJECT ONLY TO ANY APPLICABLE WARRANTIES OF THEIR RESPECTIVE MANUFACTURERS, DISTRIBUTORS AND SUPPLIERS, IF ANY. TO THE FULLEST EXTENT PERMISSIBLE BY APPLICABLE LAW, AERO HEREBY DISCLAIMS ALL WARRANTIES OF ANY KIND, EITHER EXPRESS OR IMPLIED, INCLUDING, ANY IMPLIED WARRANTIES WITH RESPECT TO THE PRODUCTS AND SERVICES LISTED OR PURCHASED ON OR THROUGH THE WEB SITE. WITHOUT LIMITING THE GENERALITY OF THE FOREGOING, WE HEREBY EXPRESSLY DISCLAIM ALL LIABILITY FOR PRODUCT DEFECT OR FAILURE, CLAIMS THAT ARE DUE TO NORMAL WEAR, PRODUCT MISUSE, ABUSE, PRODUCT MODIFICATION, IMPROPER PRODUCT SELECTION, NON-COMPLIANCE WITH ANY CODES, OR MISAPPROPRIATION. WE MAKE NO WARRANTIES TO THOSE DEFINED AS "CONSUMERS" IN THE MAGNUSON-MOSS WARRANTY-FEDERAL TRADE COMMISSION IMPROVEMENTS ACT. THE FOREGOING EXCLUSIONS OF IMPLIED WARRANTIES DO NOT APPLY TO THE EXTENT PROHIBITED BY LAW. PLEASE REFER TO YOUR LOCAL LAWS FOR ANY SUCH PROHIBITIONS. You agree to defend, indemnify and hold us harmless from and against any and all claims made by, and any and all damages and judgments (including reasonable attorneys’ fees) awarded to, any third party due to or resulting from: (1) your misuse of the Web Site or any of its contents; (2) your violation of these Terms and Conditions or any applicable law; or (3) your breach of any of your representations and warranties set forth herein. Neither Aero nor any of its affiliates, assume any responsibility, and will not be liable for, any damages to, or viruses that may infect, your computer, telecommunication equipment, or other property caused by or arising from your access to, use of, or browsing the Web Site, or your downloading of any information or materials from the Web Site. IN NO EVENT WILL AERO, ITS AFFILIATES OR ANY OF THEIR RESPECTIVE OFFICERS, DIRECTORS, EMPLOYEES, SHAREHOLDERS, MEMBERS, MANAGERS, AGENTS, SUCCESSORS OR ASSIGNS, NOR ANY PARTY INVOLVED IN THE CREATION, PRODUCTION OR TRANSMISSION OF THE WEB SITE, BE LIABLE TO YOU OR ANYONE ELSE FOR ANY INDIRECT, SPECIAL, PUNITIVE, INCIDENTAL OR CONSEQUENTIAL DAMAGES (INCLUDING, WITHOUT LIMITATION, THOSE RESULTING FROM LOST PROFITS, LOST DATA OR BUSINESS INTERRUPTION) ARISING OUT OF THE USE, INABILITY TO USE, OR THE RESULTS OF USE OF THE WEB SITE, ANY WEB SITES LINKED TO THE WEB SITE, OR THE MATERIALS, INFORMATION OR SERVICES CONTAINED ON ANY OR ALL SUCH WEB SITES, WHETHER BASED ON WARRANTY, CONTRACT, TORT OR ANY OTHER LEGAL THEORY AND WHETHER OR NOT ADVISED OF THE POSSIBILITY OF SUCH DAMAGES. THE FOREGOING LIMITATIONS OF LIABILITY DO NOT APPLY TO THE EXTENT PROHIBITED BY LAW. PLEASE REFER TO YOUR LOCAL LAWS FOR ANY SUCH PROHIBITIONS. IN THE EVENT OF ANY PROBLEM WITH THE WEB SITE OR ANY CONTENT, YOU AGREE THAT YOUR SOLE REMEDY IS TO CEASE USING THE WEB SITE. IN THE EVENT OF ANY PROBLEM WITH THE PRODUCTS OR SERVICES THAT YOU HAVE PURCHASED ON OR THROUGH THE WEB SITE, YOU AGREE THAT YOUR SOLE REMEDY, IF ANY, IS FROM THE MANUFACTURER OF SUCH PRODUCTS OR SUPPLIER OF SUCH SERVICES, IN ACCORDANCE WITH SUCH MANUFACTURER'S OR SUPPLIER'S WARRANTY, OR TO SEEK A RETURN AND REFUND FOR SUCH PRODUCT OR SERVICES IN ACCORDANCE WITH THE RETURNS AND REFUNDS POLICIES POSTED ON THE WEB SITE. We reserve the right to modify these Terms and Condition at any time. If we modify these Terms and Conditions, we will post the revised Terms and Conditions on the Web Site and note the date the Terms and Conditions was last updated. We also may highlight the link to the Terms and Conditions, post a notice on the Web Site or send an email describing the changes. Your continued use of the Web Site following any revisions to these Terms and Conditions signifies your agreement to be bound by the revised Terms and Conditions. You should visit this page from time to time to review the then current Terms and Conditions. Additional terms may apply in connection with certain features of the Web Site (e.g. testimonials, sweepstakes or contest entries). If applicable, these additional terms will be made available to you, for example: (i) where you are permitted to submit materials, enter a promotion, access or use particular features, or purchase specific products and services, or (ii) in a link adjacent to where you are permitted to submit materials, enter a promotion, access or use particular features, or purchase specific products and services. Unless otherwise stated, those additional terms are incorporated into and made a part of these Terms and Conditions by reference. In the event those additional terms conflict with these Terms and Conditions, the additional terms shall control solely with respect to the subject matter to which those additional terms apply. For clarity, only DMCA notices should go to the Copyright Agent. You acknowledge that if you fail to comply with all of the requirements of this section, your DMCA notice may not be valid. Notification that fails to comply with the foregoing will not constitute knowledge or awareness of infringement. We suggest that you consult your legal counsel before filing a claim. These Terms and Conditions supersede any other agreement between you and Aero to the extent necessary to resolve any inconsistency or ambiguity between them. These Terms and Conditions will be governed by and construed in accordance with the laws of the state of New York, without giving effect to any principles of conflicts of laws. Any action seeking legal or equitable relief arising out of or relating to the Web Site will be brought only in the courts of the state of New York or the United States District Court for the Southern District of New York. A printed version of these Terms and Conditions will be admissible in judicial and administrative proceedings based upon or relating to these Terms and Conditions to the same extent and subject to the same conditions as other business documents and records originally generated and maintained in printed form. Unless you elect to conduct the arbitration by telephone or written submission, an in-person arbitration hearing will be conducted at the JAMS facility in your area. The arbitration shall be conducted by a single arbitrator under JAMS’ Streamlined Arbitration Rules & Procedures. For claims exceeding $5,000.00, the arbitration shall be conducted under JAMS’ Comprehensive Arbitration Rules & Procedures Subject to the applicable JAMS procedure, the arbitrator shall allow reasonable discovery in the forms permitted by the Federal Rules of Civil Procedure, to the extent consistent with the purpose of the arbitration. The arbitrator(s) shall have no power or authority to amend or disregard any provision of this section or any other provision of these Terms and Conditions, except as necessary to comply with JAMS’ Policy on Consumer Arbitrations Pursuant to Pre-Dispute Clauses Minimum Standards of Procedural Fairness. The arbitration hearing shall be commenced promptly and conducted expeditiously. If more than one day is necessary, the arbitration hearing shall be conducted on consecutive days unless otherwise agreed in writing by the parties. The arbitrator(s) shall, after reaching judgment and award, prepare and distribute to the parties written findings of fact and conclusions of law relevant to such judgment and award and containing an opinion setting forth the reasons for the giving or denial of any award. The award of the arbitrator(s) shall be final and binding on the parties, and judgment thereon may be entered in a court of competent jurisdiction. You will be subject to a $250 filing fee to initiate an arbitration. To the extent permitted by JAMS procedures, each party shall bear its own costs and expenses and an equal share of the arbitrators' and administrative fees of arbitration. Aero will be responsible for its share of costs, expenses and fees plus any costs, expenses and fees required of it under JAMS procedures. Except where prohibited by law, the prevailing party shall be entitled to an award of reasonable attorney fees. The Federal Arbitration Act and federal arbitration law apply to this Agreement. Either party also may, without waiving any remedy under this Agreement, seek from any court having jurisdiction any interim or provisional relief that is necessary to protect the rights or property of that party, pending the establishment of the arbitral tribunal (or pending the arbitral tribunal's determination of the merits of the controversy). We also both agree that you or we may bring suit in court to enjoin infringement or other misuse of intellectual property rights. The Federal Arbitration Act and federal arbitration law apply to these Terms and Conditions and you agree that any arbitration or other proceedings by or between you and Nautica will be conducted on an individual basis and not in any class action, consolidated or representative basis. You further agree that the arbitrator shall have no authority to award class-wide relief. You acknowledge and agree that this agreement specifically prohibits you from commencing arbitration proceedings as a representative of others. If for any reason a claim proceeds in court rather than in arbitration, we each waive any right to a jury trial. You or we may suspend or terminate your account or your use of the Web Site at any time, for any reason or for no reason. You are personally liable for any orders placed or charges incurred through your account. We reserve the right to change, suspend, or discontinue all or any aspect of the Web Site at any time without notice.